This was surprisingly easier than I was expecting! Special thanks to Steve for letting me loose on his test network for the Meraki end of the tunnel. Here I’m using an MX 64 Security appliance, and a Cisco ASA 5510. 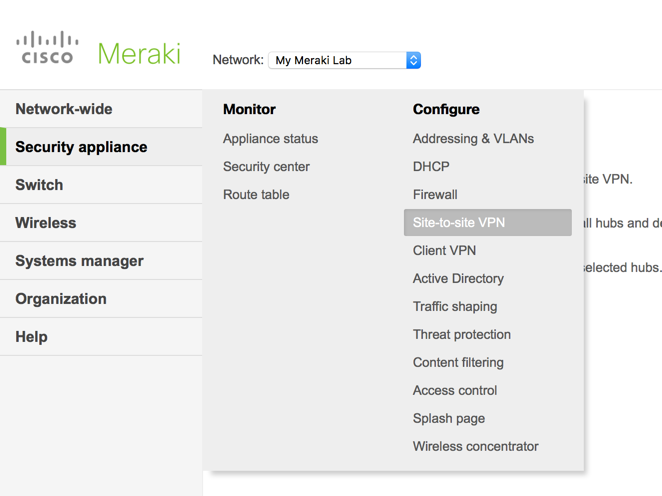 From your Meraki dashboard > Security Appliance > Site To Site VPN. If you have no VPNs setup then you will need to select ‘Hub’, then scroll down to ‘Non-Meraki VPN Peers’ > Add a peer. 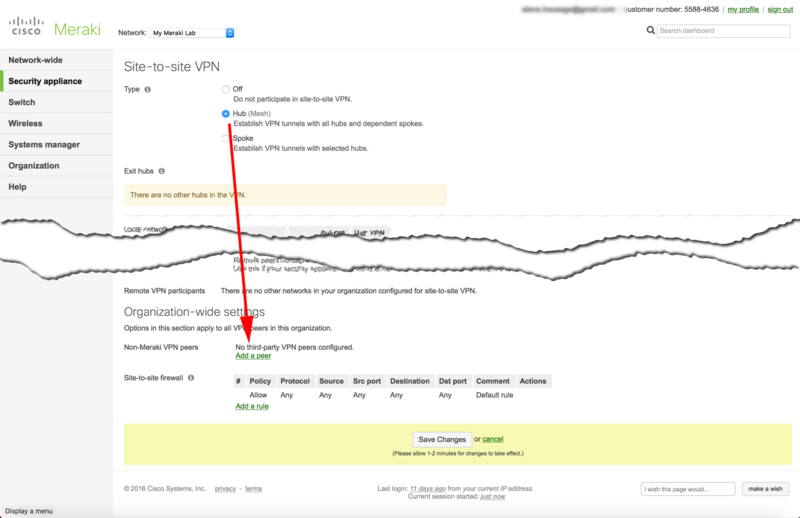 Note: If you click the IPSEC policy you will see what it wants to use for phase 1 and phase 2 of the VPN tunnel. BE AWARE: By default PFS (Perfect Forward Secrecy) is disabled. 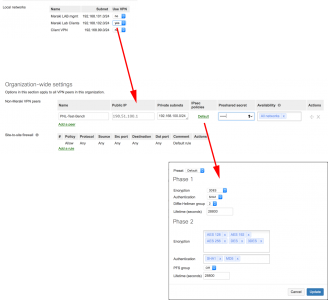 If you setup your AS VPN from within the ASDM wizard this may be enabled on the ASA. More reason to use the command line options I give you below! If you don’t know the public IP of your Meraki device, here is where to find it (so you can use it when configuring the ASA). To make things simple, change the values in RED below then you can paste in the command to your Cisco ASA. WARNING: Below I use a crypto map called CRYPTO-MAP If you already have one then CHANGE the name to match your existing one (‘show run crypto map‘ will show you). e.g. if yours is called outside_map then change the entries below to outside_map 2. Note: This config uses newer (post 8.3) NAT commands. Lifetimes are specified by the initiator (usually). 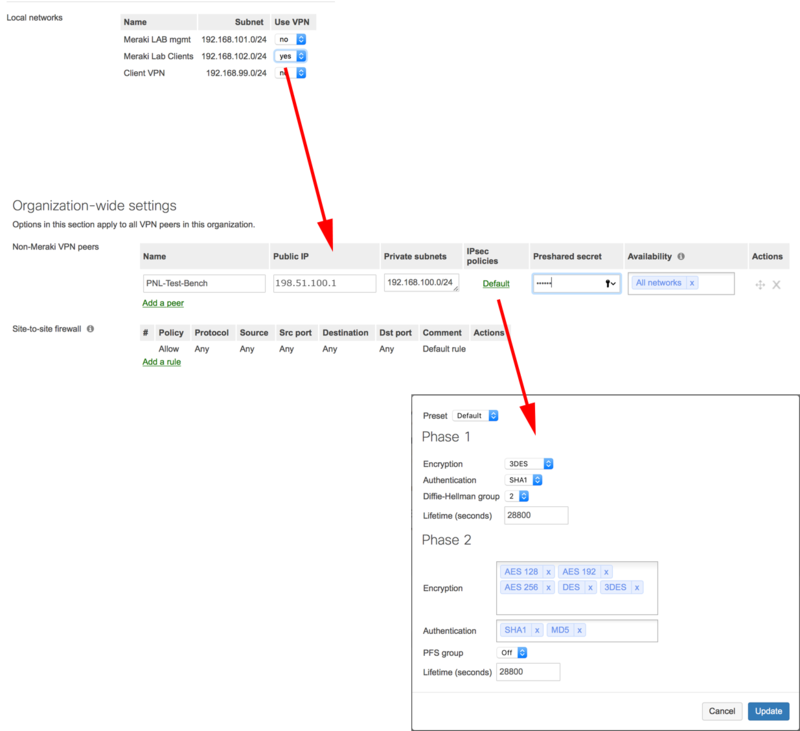 How to do this if the Meraki is on a DHCP-assigned external address (e.g. SOHO)? Doesn’t look like Meraki can connect via EZVPN. You don’t! 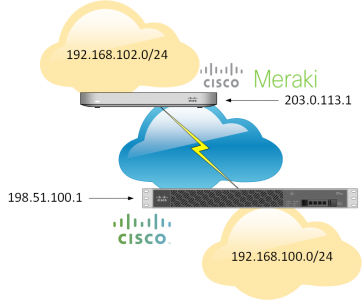 If your Meraki has a DHCP public address then you need a Meraki at both ends to form a VPN. EXVPN is a Cisco solution, Meraki might be owned by Cisco, but its a completely different product set. is it not possible to have a dynamic map at the ASA site? or is the meraki only reporting its Public IP as the identifier? The Meraki does not support EZVPN, it needs a static IP (if it’s taking to an ASA) you would need a Meraki at both ends to achieve this. Is it possible for the Meraki to identify itself with its hostname instead of IP adres, in that case u should be able to create a Dynamic crypto map at the ASA site, correct?